It's an old saying, "Money doesn't buy happiness." But, it turns out it might not be true. Higher incomes are associated with greater happiness across countries. According to The Economist, the key to spotting the correlation is to use a logarithmic scale rather than a linear one. 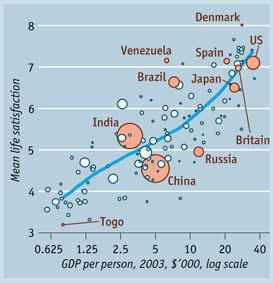 [Economists] who look at happiness often contend that, beyond a GDP per capita of just $15,000 (measured at purchasing-power parity), money does not buy happiness. ... But plot the data another way, on a logarithmic scale where each increment represents a 100% increase in income per head, and the relationship between wealth and happiness looks more robust.